The spotted quoll, the spotted-tailed dasyure or (erroneously) the tiger cat, is a carnivorous marsupial of the quoll genus Dasyurus native to Australia. With males and females weighing around 3.5 kg and 1.8 kg respectively, it is mainland Australia's largest, and the world's longest (the biggest is the Tasmanian Devil), living carnivorous marsupial and it is considered an apex predator. Two subspecies are recognised, the nominate is found in wet forests of southeastern Australia and Tasmania, and a northern subspecies gracilis is found in a small area of northern Queensland and is endangered. The tiger quoll is the largest of the quolls. The tiger quoll has a reddish-brown pelage with white spots and colourations do not change seasonally. It is the only quoll species with spots on its tail in addition to its body. Its fur and skin are covered in orange-brown coloured oil. The underside is typically grayish or creamy white. The tiger quoll is found in eastern Australia where there is more than 600 mm of rainfall per year. Historically the quoll was present throughout southeastern Queensland, though eastern New South Wales, Victoria, southeastern South Australia and Tasmania. 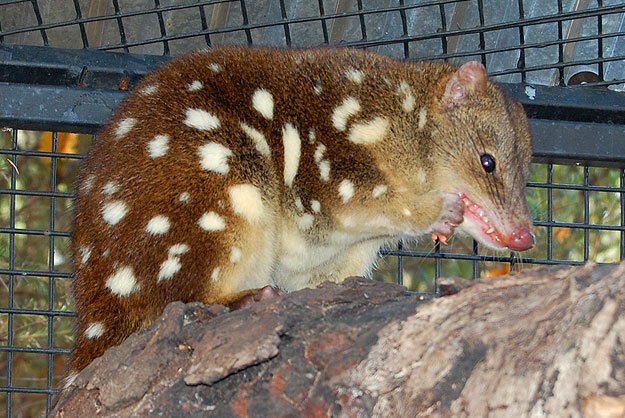 European settlement has severely decimated and fragmented the quoll's mainland distribution. Tiger quolls are rare in southeastern Queensland. In Victoria quoll populations have declined by nearly 50%. The range decline was not as severe in New South Wales but they are still rare. The quoll was probably never very numerous in South Australia. In Tasmania, the tiger quoll mostly frequent the northern and western areas where is seasonal rains. Tiger quolls were once native to Flinders and King Islands but were extirpated since the 20th century and are thus not present all Tasmanian offshore islands. Tiger quolls live in a variety of habitats but seem to prefer wet forests such as rainforests and closed eucalypt forest.Prey items eaten by quolls include insects, crayfish, lizards, snakes, birds, domestic poultry, small mammals, platypus, rabbits, arboreal possums, pademelons, small wallabies and wombats.They may scavenge larger prey like kangaroos, feral pigs, cattle and dingoes.However the tiger quoll does not scavenge as much as the Tasmanian devil. Much of the prey eaten by the quoll are arboreal. They can climb high into trees and make nocturnal hunts for possums and birds.The flexibility of their diet suggests that their prey base is not detrimentally affected by bushfires. When hunting, a quoll stalks its prey, stopping only when its head is up. It then launches its attack, executing a killing bite to the base of the skull or top of the neck, depending on the size of the prey. The quoll will pin small prey down with forepaws and them deliver the bite. With large prey, the quoll jumps and latches on its back and bites the neck. Quolls themselves may be preyed on by Tasmanian devils and masked owls in Tasmania and dingos and dogs in mainland Australia. It may also be preyed on by wedge-tailed eagles and large pythons. Tiger quolls yield to adult devils but will chase subadults away from carcasses. It is also possible that quolls compete with introduced carnivores such as foxes, cats and wild dogs.